In terms of size and amount of wild, remote scenery, Dark Canyon is equalled only by the San Rafael Swell for areas of Utah not part of an NPS preserve, though it was briefly within the BLM-administrated Bears Ears National Monument. 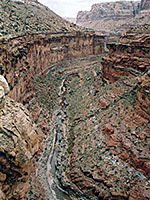 The canyon, its tributaries, and several nearby Colorado River drainages (Bowdie, Gypsum) are part of a wide tract of protected land, divided into Dark Canyon Wilderness Area and the larger Dark Canyon Primitive Area, which range in character from desert-like, rocky canyons towards the west, near the river - elevation around 4,000 feet - to forested valleys containing natural arches and Anasazi ruins in the east, where elevations rise up to 8,000 feet, in the foothills of the Abajo Mountains. 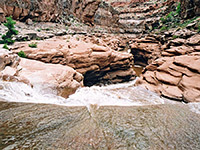 The two preserves have similar regulations but are managed by different agencies; the primitive area by the BLM and the wilderness by the US Forest Service. One aspect common to the whole region is the difficulty of access, as apart from the Sundance Trail near the lower end of Dark Canyon, reaching trailheads and viewpoints requires a long drive over rough tracks, then exploring the canyons in any depth can be done only by several days backpacking. Much of the gorge resembles a smaller version of the Grand Canyon, as it cuts deep into various sandstone & limestone strata, different in hardness but mostly red/brown in color, that form a series of vertical cliffs separated by level benches. 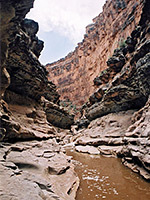 The upper strata tend to have scattered bushes growing so are more gray-green, though the whole canyon is rather dark and sombre in appearance; this, together with the combination of depth and narrowness plus the east-west orientation that limits direct sunlight, give the gorge its name. All these rocks are older than, and hence below, the white Cedar Mesa sandstone that characterises the next canyon system to the west, that of White Canyon. The most popular day trip is down the Sundance Trail, while the simplest multi-day hike starts along one of two upper tributaries - Peavine or Woodenshoe - then continues down the main drainage of Dark Canyon, exiting via the Sundance Trail. This trip is around 30 miles one-way, and takes 2 or 3 days. The upper trailheads for either hike are close together along FR 108, quite a good track that is linked to UT 275 (the road to Natural Bridges National Monument) by FR 088. From here a network of other tracks extends north, becoming generally rougher further from the highway, but giving access to other trailheads at the far upper end of Dark Canyon and to tributary ravines on either side, including Trail, Poison, Youngs, Lean-To, Rig and Horse Pasture canyons. Even further north, a 4WD road leads to Fable Valley and hence Gypsum Canyon - a remote region that can also reached via Beef Basin, starting from near Newspaper Rock on the road to the Needles district of Canyonlands National Park.